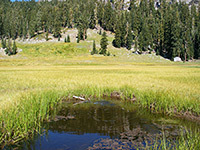 Several hiking destinations may be reached starting from the Kings Creek picnic area, about half way along the scenic drive through Lassen Volcanic National Park, closest being Cold Boiling Lake and Crumbaugh Lake - both small but scenic, bordered by pine forest and long grass meadows. Cold Boiling Lake is not quite as interesting as it sounds, since it bubbles only very gently in a few isolated places, due to escaping carbon dioxide gas, unlike the much more vigorous thermal behavior of Boiling Springs Lake in the Warner Valley region of the park. 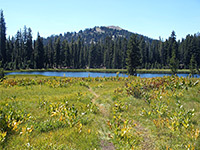 The 0.8 mile path to the lake is quick and easy, however, and the larger Crumbaugh Lake is not far beyond - both can be seen in just an hour or so. Map of Lassen Volcanic National Park. Panorama of Crumbaugh Lake. Full screen version (21 mb). Cold Boiling Lake (mp4; 0:19 min; 3.6 mb). The picnic area beside Kings Creek is reached by a short side road, and is far enough away from the highway to be quiet and peaceful. The narrow creek flows past through open meadowland, and a short footpath follows the stream eastwards a way, but the main route (not marked by any sign) sets off to the south. The trail climbs a lightly wooded slope and crosses flatter, dusty land to the first junction, which does have a notice; the left fork is to Twin Meadows, a rarely-visited location close to the southern park national boundary. The right fork enters a thicker band of fir and pine trees and descends slightly to a second junction just before Cold Boiling Lake, which is 400 feet across and quite shallow, surrounded by trees on three sides and with a big grassy area on the other. Steep, rocky hills rise to the north, traversed by one branch of the trail, a steep route that climbs steadily and arrives at Bumpass Hell after another 1.5 miles. The main part of the lake does not bubble, only a small, detached, muddy pool on the west side (see video). An NPS sign advises visitors to watch carefully for the bubbles, in case they are not obvious. The other branch of the trail continues southwest, level at first then gradually descending, through a forest of larger trees to the edge of Crumbaugh Lake, also bordered by extensive grassland. This lake is prettier, filled with clear water and within sight of several distant peaks including Mount Conrad to the south and 8,753 foot Bumpass Mountain to the northwest. A faint loop path circles the edge, while the main trail heads off towards Mill Creek Falls, 1.7 miles away, and eventually to the southwest entrance station. The edges of Crumbaugh Lake are marshy and there are no beaches, so the place is not good for paddling.